A dream child of a president. It all began in 1977 when the then President of France Giscard de Estaig wanted Paris to have something more than Eiffel tower to be proud of. It should be the most modern and educative establishment in the world was his concept. The 150,000 sq Meter Science City with all technological wonders like space walking, a journey through within human cells or robots that act intelligently were all provided in it along with shops, banks, bars, rest areas etc had its origin from that idea. A hothouse functions as a bridge to the lobby forty meters wide actually a tropical forest! Trees and plants exclusively found in tropical areas flourish on fabric soaked in concentrated nutrition gel. There is the ancient ‘sun-dial’ used by Egyptians rubbing shoulders with latest atomic clock that is accurate to split seconds in a millennium. A virtual Amazon forest in Paris! The whole Science City (as it was renamed by Francois Mitterand) includes four main themes, universe, life, matter and communication. Maurice Levy and Adrien Fainsilber. The famous scientist Maurice Levy (Levy was former head of France’s Space Research Center) was the person entrusted for the dream job; he was given freedom to appoint experts capable of executing a project with unheard of facilities that was intended to excel gizmos not even found science fictions. Adrien Fainsilber secured the job of architect easily with the marvel he made in the form of the facade (glittering 1024 sq. meter structure) that entirely hung on steel ropes. This structure was enough and more to state the characteristic style of the museum even before entering in it. This museum has many sections like which can be classified in to mainly four themes. Which are Universe, Life, Matter and Communication. Universe. This trip is educative as well as thrilling it includes matters like the continental drifts, details about the great oceans their depth areas shape and size, latest space expeditions, the Ariane Rocket a full size satellite etc. Youngsters can experience the orbital pin ball machine as well as feel weightless ness inside the satellites –a real space flight simulator! 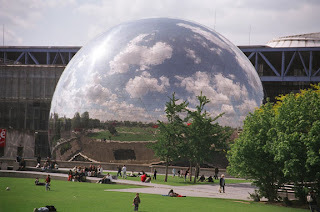 Planetarium in Le Villette is the most modern in Europe with a collection of 10,000 stars and the most advanced technology it is capable of presenting subject in the accompaniment of high drama, as witness Jean Claude Carriere’s scenario of ‘the life and death of a star’ and the forthcoming spectacle, ‘The ‘Bionauts’, writtn by de Rosnay. For this show the Planetarium will be transformed in to a ‘cellularium’ where spectators can virtually travel through a human cell witnessing all the physiological activities taking place in it! Argonaut Sub-marine. Nautilus; the legendary submarine in Jules Verne science fiction Twenty thousand Leagues Under the Sea. Geode. A 36 meter in diameter sphere made in stainless steel walls; inside supported by a single pillar built a hemispheric film auditorium which can accommodate 370 spectators. Geode stands rubbing shoulders with Eiffel Tower in style. Cinaxe, aquarium, media library from which books in the city’s all libraries can be referred all are just some of the facilities available here. Cinema. A session lasting 90 minutes including one show of Louis Luminaire film for every batch (free for children under seven who hold Paris museum pass). There is also a ‘kool robot’ to explain the thought process going on in the brain. There is an A-320 air craft to take passengers for a simulated ride. One who is new to the site may get rather perplexed as there is no definite fenced-path for sight seeing, they are free to choose the sites as per their wish. However electronic information boards issue commentaries which (in three languages English, French and Spanish) are of help to choose itineraries. Earphones are available on rent to hear the commentaries of visitors’ choice. The French Revolution was a scintillating portion of the history of the world as it smashed all concepts about rulers and the ruled, it was also a dramatic period in scientific advancement as it was since 1789 scientists helped politicians to define man’s place in nature. Here live artists perform a recreation of historic events like Napoleon Bonaparte listening to scientists while on tour to Egypt. There is the salon of Sophie de Condorcet explaining her husband planning to introduce the ‘metric system’. In the Geode a movie by Pierre Etaix traces the saga of telecommunications starting with Claude Chappe’s 1794 Semaphore Telegraph. The authorities here look for ideas based on public interest, news-worthiness, chances of co-production with outside sponsors, and after careful scrutiny they name a commissioner for the project to do direct research on the show’s content, its financing, its decor. There is a scientific committee to check the validity of the data collected. It is the duty of the architects to plan the space as visitor’s first glimpse of the show is important. Only after the evaluation of all these features a show will be introduced at the venue. There is Napoleon, Claude Chappe, Jules Verne, Pierre Etaix, Luminaire, French Revolution, all have a French touch. La Villette is definitely a mark of French pride in its statements. France had much which went un-noticed if La Villette’s attempts to project them they are amply justified for it, let their good intensions prevail.